Lionel Messi is the greatest footballer in the history of planet Earth, and he scored two wonderful free kicks in Barcelona's 5-4 UEFA Super Cup win over Sevilla on Tuesday. But despite the fact that he's an alien put on Earth to embarrass humans at the game they invented and love more than any other, he refuses to acknowledge how good he is. 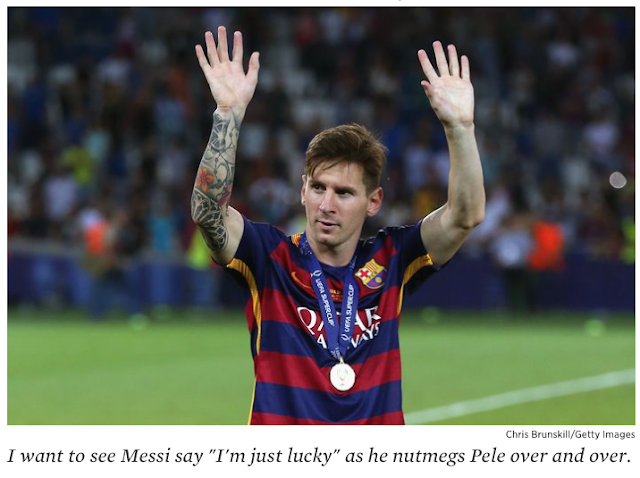 "I've just been lucky enough to score those," said Messi, who really needs to stop being so humble. By the way, those goals mean he's equal with Cristiano Ronaldo for goals in all European competitions now. Messi's played 19 fewer games.